Hávamál (English: /ˈhɑːvəmɑːl/ HAH-və-mahl; "sayings of the high one"; Old Norse pronunciation: [ˈhɒːwaˌmɒːl], Icelandic pronunciation: ​[ˈhauvaˌmaul̥]) is presented as a single poem in the Codex Regius, a collection of Old Norse poems from the Viking age. The poem, itself a combination of different poems, is largely gnomic, presenting advice for living, proper conduct and wisdom. The verses are attributed to Odin; the implicit attribution to Odin facilitated the accretion of various mythological material also dealing with the same deity. For the most part composed in the metre Ljóðaháttr, a metre associated with wisdom verse, Hávamál is both practical and philosophical in content. Following the gnomic "Hávamál proper" comes the Rúnatal, an account of how Odin won the runes, and the Ljóðatal, a list of magic chants or spells. The only surviving source for Hávamál is the 13th century Codex Regius. The part dealing with ethical conduct (the Gestaþáttr) was traditionally identified as the oldest portion of the poem by scholarship in the 19th and early 20th century. Bellows (1936) identifies as the core of the poem a "collection of proverbs and wise counsels" which dates to "a very early time", but which, by the nature of oral tradition, never had a fixed form or extent. Von See (1981) identifies direct influence of the Disticha Catonis on the Gestaþáttr, suggesting that also this part is a product of the high medieval period and casting doubt on the "unadulterated Germanic character" of the poem claimed by earlier commentators. To the gnomic core of the poem, other fragments and poems dealing with wisdom and proverbs accreted over time. A discussion of authorship or date for the individual parts would be futile, since almost every line or stanza could have been added, altered or removed at will at any time before the poem was written down in the 13th century. Individual verses or stanzas nevertheless certainly date to as early as the 10th, or even the 9th century. Thus, the line deyr fé, deyja frændr ("cattle die, kinsmen die") found in verses 76 and 77 of the Gestaþáttr can be shown to date to the 10th century, as it also occurs in the Hákonarmál by Eyvindr skáldaspillir. The Hávamál is edited in 165 stanzas by Bellows (1936). Other editions give 164 stanzas, combining Bellow's stanzas 11 and 12, as the manuscript abbreviates the last two lines of stanzas 11. Some editors also combine Bellow's stanzas 163 and 164. In the following, Bellow's numeration is used. Stanzas 6 and 27 are expanded beyond the standard four lines by an additional two lines of "commentary". Bellow's edition inverses the manuscript order of stanzas 39 and 40. Bellow's stanza 138 (Ljóðalok) is taken from the very end of the poem in the manuscript, placed before the Rúnatal by most editors following Müllenhoff. Stanzas 65, 73–74, 79, 111, 133–134, 163 are defective. Stanzas 81-84 are in málaháttr, 85–88 in fornyrðislag. The entire section of 81–102 appears to be an ad hoc interpolation. Stanza 145 is also an interpolation in málaháttr. The first section Gestaþáttr, the "guest's section". Stanzas 1 through 79 comprise a set of maxims for how to handle oneself when a guest and traveling, focusing particularly on manners and other behavioral relationships between hosts and guests and the sacred lore of reciprocity and hospitality to the Norse pagans. hveim er sér góðan getur." Stanzas 83 to 110 deal with the general topic of romantic love and the character of women. It is introduced by a discussion of the faithlessness of women and advice for the seducing of them in stanzas 84–95, followed by two mythological accounts of Odin's interaction with women also known as "Odin's Examples" or "Odin's Love Quests". The first is an account of Odin's thwarted attempt of possessing the daughter of Billing (stanzas 96–102), followed by the story of the mead of poetry which Odin won by seducing its guardian, the maiden Gunnlöð (stanzas 103–110). The Loddfáfnismál (stanzas 111–138) is again gnomic, dealing with morals, ethics, correct action and codes of conduct. The section is directed to Loddfáfnir ("stray-singer"). The "windy tree" from which the victim hangs is often identified with the world tree Yggdrasil by commentators. The entire scene, the sacrifice of a god to himself, the execution method by hanging the victim on a tree, and the wound inflicted on the victim by a spear, is often compared to the crucifixion of Christ as narrated in the gospels. The parallelism of Odin and Christ during the period of open co-existence of Christianity and Norse paganism in Scandinavia (the 9th to 12th centuries, corresponding with the assumed horizon of the poem's composition) is also evident from other sources. To what extent this parallelism is an incidental similarity of the mode of human sacrifice offered to Odin and the crucifixion, and to what extent a Pagan influence on Christianity, or vice versa, may have occurred, is a complex question on which scholarly opinions vary. Nor men that are sons of men. The songs themselves are not given, just their application or effect described. They are explicitly counted from "the first" in stanza 147, and "a second" to "an eighteenth" in stanzas 148 to 165, given in Roman numerals in the manuscript. Nevertheless, because of the Rúnatal preceding the list, modern commentators sometimes reinterpret the Ljóðatal as referring to runes, specifically with the sixteen letters of the Younger Futhark. Müllenhoff takes the original Ljóðatal to have ended with stanza 161, with the final three songs (16th to 18th) taken as late and obscure additions. The difference of sixteen runes of the Younger Futhark vs. eighteen charms in the Ljóðatal has notably motivated proponents of Germanic mysticism to expand the row by two extra runes. The best-known attempt to this effect are the Armanen runes by Guido von List (1902). Various proponents of Germanic Neopagan groups place an emphasis on Hávamál as a source of a Norse pagan ethical code of conduct. The "Nine Noble Virtues", first compiled by Odinic Rite founder John "Stubba" Yeowell in the 1970s are "loosely based" on the Hávamál. The Northvegr Foundation cites the Hávamál among other Old Norse and Old English sources to illustrate "the ethical ideal of the Northern spiritual faith of Heithni." Sveinbjörn Beinteinsson, leader of the Icelandic Ásatrúarfélagið, published his performance of a number of Eddaic poems, including the Hávamál, chanted in rímur style. Olive Bray, The Elder or Poetic Edda, commonly known as Sæmund's Edda, part I: The Mythological Poems, London: Printed for the Viking Club, 1908, pp. 61–111. 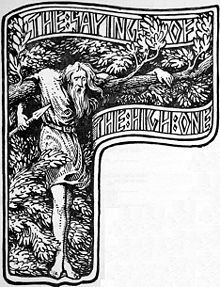 H. A. Bellows, The Poetic Edda, 1936, "Hovamol: The Ballad of the High One" (online edition). Jackson Crawford, The Poetic Edda: Stories of the Norse Gods and Heroes, 2015 (google books). ^ Bellows (1936), introductory note. ^ Richardson, Nathaniel Smith; Boggs, Edward Brenton; Baum, Henry Mason (1872). The Church Review. Bassett and Bradley. ^ Klaus von See: „Disticha Catonis und Hávamál.“ In: Klaus von See: Edda, Saga, Skaldendichtung. Heidelberg 1981, 27-44. ^ Bellows, Henry Adams (2012). The Poetic Edda: The Heroic Poems. Dover Publications. ^ a sketch of the problem is given by Kimberley Christine Patton, Religion of the gods: ritual, paradox, and reflexivity Oxford University, ISBN 978-0-19-509106-9, chapter 7 "Myself to Myself: The Norse Odin and Divine Autosacrifice". ^ Bellows separates the "seventeenth" item into stanzas 163 and 164. There is a gap in stanza 163, and some editors have also combined 163 and 164 into a single stanza. "Havamal - Translation by Benjamin Thorpe". Archived from the original on 2008-05-15. This page was last edited on 27 March 2019, at 19:06 (UTC).